Muir, Rory. Tactics and the Experience of Battle in the Age of Napoleon. New Haven: Yale University Press, 1998. ISBN# 030007852. $40. Hardcover. Or, ISBN# 0300082703. $16.95. Paperback. 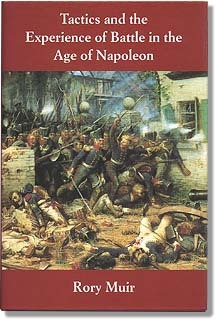 April 2000 saw Rory Muir's Tactics and the Experience of Battle in the Age of Napoleon released in paperback. For those who are not familiar with the book, Tactics examines Napoleonic warfare from the perspective of the individual. Using a wide range of diaries and memoirs, Mr. Muir shows what it was like to be a soldier in combat during the Napoleonic Wars. He divides the books into four sections, each one covering a major topic. The introduction brings to life the feelings of the soldiers, the night before a battle and what they hoped the next day would bring. He also writes of those physical factors that could affect the outcome of the pending battle —the terrain, the weather, supplies, the health of the soldier, etc. The second section, called "The Elements of Combat," looks at the three different combat arms: the artillery, infantry, and cavalry. He describes how each element was or could be deployed and then uses first-hand accounts to illustrate this. Here you will find vivid descriptions by French, Prussian, and British gunners of what it was like to move and fire their guns, standing to receive cavalry, and how a hasty retreat was often the better part of valor! He covers the infantry in two parts -one for the light infantry and one for the line infantry. In each chapter, Mr. Muir talks first about how the infantry are organized and deployed in theory, but then he illustrates his points with numerous first-hand accounts. He ends the section with the cavalry. Like the chapters on artillery and infantry, Mr. Muir brings the role of the cavalryman to life and the reader will hear from veterans what it was like to ride with the British heavy cavalry at Salamanca and the Saxon Zastrow Cuirassiers at Borodino. Mr. Muir also looks beyond just the combat arms and examines those intangibles that affect the outcomes of the battle: the role of the general, his staff, his subordinate commanders, the regimental offices, and those factors that affect morale. He ends with a section that is called "The End of the Day." Here the horrors of the night after the battle has been fought are shown from the rout of a defeated army to the terror of facing amputation. Tactics closes with something that is rare in books today -a "Bibliographic Essay." Here Mr. Muir discusses in detail the sources he used to write this book. He points the reader to the best primary sources both in books and magazines. He also provides valuable insight into a variety of books that have been published in the past 150 years. This essay, combined with the book's detailed bibliography, will be a great starting place for those interested in doing their own research. Tactics is a very readable work that provides the human face to the Napoleonic battles. When read with Imperial Bayonets it brings to life the drills, maneuvers, and regulations that Mr. George Nafziger so deftly describes! Although Mr. Muir relies heavily on British memoirs, there are many passages from French, Prussian, Russian, Saxon, and other nationalities. It becomes very clear, no matter whose perspective is shown, the experiences being described were universal to all soldiers of the era! Tactics is a must read for both the casual reader and the dedicated enthusiast!